I am obese, fat, fluffy, heavy, big boned or whatever term you want to call me, a person that weighs to much. I have been heavy all of my life that I can remember. I can also say that I love to eat good tasting food. Being 65 years old (all most) I am now developing or have developed some of the problems that go along with my weight. I have tried every diet and quick fix under the sun. At one time when I lived in Hawaii I lost 110 pounds. I was walking, dancing, scuba diving and having the time of my life. I came back to the mainland and all that stopped. I was in contrast turmoil over my son being in Iraq during Desert Storm. I am a stress eater and I gained every pound back and more. Let me tell you, having weight loss surgery is far from easy. It involves a total commitment to a lifestyle change. Before my surgery nearly three years ago, I met with my surgeon, nutritionists, exercise coaches and a psychologist. I went to classes and learned about meals, exercise and how my body would change. We learned about plastic surgery — how many weight loss patients have their skin tucked because they have all this excess skin hanging from your body in weird places. I was prepared, or so I thought. On November 23, 2011, the day before Thanksgiving, I went under the knife. Since then, I’ve lost 268 pounds. But the thing they do not prepare you for is how you change emotionally after losing a large amount of weight. At first, I thought I would just have this newfound confidence. I’d be thinner and want to run around naked. OK, maybe not naked, but I had this fantasy in my head that one day I would wake up with a body that I loved and would feel comfortable putting into a bikini — that I’d have no body shame whatsoever. People would accept me more because I wasn’t seen as obese and unhealthy. Dating would get easier. Clothes would fit better. I wouldn’t be judgmental toward other extremely obese people because I was once huge. First off, even though I feel amazing and I am starting to like the way I look, there are days in which I hate my body. I hate how certain clothes push against my excess skin, making it bulge out (think muffin top, but worse). I hate the way the skin hangs down on my arms, and thighs, back and stomach. I hate that it will take at least $15,000 (if not more) in plastic surgery to rid these last 30 to 40 pounds off of my body. I also have stretch marks and surgery scars across my abdomen and stomach, so being intimate with my boyfriend can be intimidating at times. I knew what I was getting into when I signed up for this, but that knowledge doesn’t erase the self-consciousness I feel when I get out of the shower, or when a stranger or child snickers because they don’t understand why my body looks the way it does. My relationships also changed. When I first had my surgery, the guy I was with had been a best friend of seven years. He found me attractive at 486 pounds, though I’m not sure why. But once I lost my first 68 pounds, he left. My surgeon explained that this is common among his bariatric patients. For some reason, it can shake the other partner psychologically when one loses weight, gains confidence and starts getting more attention. But the experience taught me that someone who is jealous of something that makes me better, healthier and stronger never had my best interests at heart. Dating after that was a struggle, until I met my current boyfriend six months ago. Most guys got scared because they were afraid to take me to dinner, afraid they would break my new diet resolve, and when they saw a picture of what I used to look like, they started to wonder what would happen if I gained a few pounds again. What else has surprised me about losing weight? No one ever told me that it would upset me when severely obese people get special attention because they choose to be heavy — like when TV shows feature people who are happy to weigh 600 pounds, or people who post YouTube videos professing love of their excess weight. Don’t get me wrong, I think it is great that people are comfortable in their own skin, because many times I’m not always comfortable in my own skin. But for me, being heavy wasn’t a choice. So I guess I have a hard time identifying with them. Obesity is debilitating to your health. I used gastric bypass surgery as a tool to save my life so that I wouldn’t develop diabetes, have a heart attack at age 35, have a stroke, and to hopefully lower my risk of cancer. Now I have no tolerance for excuses about not being able to eat healthy and exercise. See, here’s the bottom line: The biggest thing that no one ever tells you about losing weight is that eventually, the number on the scale no longer matters. What matters is how you feel, how you look and how happy you are. I know at my current weight I am still medically obese, but I have a clean bill of health. Through my bad days and my good days, I am happier now than I have ever been. When I struggle or feel myself about to slip into old habits, I pull out a picture of what I used to look like. And I remind myself that nothing tastes as good as being healthy feels. Hello all. Todays blog was brought to you by Sophie, who spent the night at the emeregency hospital after receiving a bite through the trachea from her big brother, Andy. It was a scary time. Our animals are basically are kids since ours have grown up and left. That’s a whole nother story, so I’ll let that go. The vet exam and the night at the hospital under observation was $500.00. I have insurance for my others, but not on Sophie yet, so it was directly out of our pocket. In comparison to human medical care and animal care, I think they run neck and neck. One is just as expensive as the other. How much is that doggy (or kitty, or birdie) in the window really? The total price tag is probably a lot more than you think. One look at those puppy-dog eyes and wagging tail and it’s easy for all your money smarts to fly out the window. Nonetheless, it is important to consider your lifestyle and budget before bringing home Fluffy or Fido. While there are many foreseeable expenses, such as food and toys, other costs may come as a shock. Need a dog walker, for instance? That can cost as much as $5,200 annually. Pet boarding can extract hundreds of dollars from your bank account, especially if you travel several times a year. Maybe your budget can easily accommodate regular pet-care expenses, but are you prepared for the higher costs of emergency care? It’s a question that some pet-adoption groups pose to would-be owners: How much money are you prepared to spend on Fido in an emergency? $1,000? $5,000? $10,000? What about for your hamster or parakeet? Over the years, the Longs had budgeted for emergency pet care, and they have pet insurance, so the financial hit wasn’t as bad as it could have been. The Longs are getting back more than $4,500 of their expenses from Bailey’s insurance. “Bailey is our family,” Long says, “so we just told the vet, ‘Do what you need to do.’ It didn’t occur to me until this was all over that some owners might have had to consider euthanasia as an option if they weren’t as prepared for all the bills. As veterinary procedures become more advanced, people are less likely to put their pet to sleep when it gets severely sick or injured. Owners will likely incur at least one $2,000 – $4,000 bill for emergency care at some point during their pet’s lifetime, says Dr. Louise Murray, vice-president of the American Society for the Prevention of Cruelty to Animals (ASPCA) Bergh Memorial Animal Hospital, in New York City. Preventive care is also important in corralling costs. Having a pet is “kind of like owning a car,” Murray says. “If you don’t do what you’re supposed to do, it will end up being a lot more expensive in the end.” That means getting your pet spayed or neutered, going to the vet for annual check-ups, keeping your pet’s vaccinations and preventive medicines up to date, feeding you pet the proper food, and keeping your pet confined indoors or in a yard and out of harm’s way. Although the cost of routine care is more predictable, it varies widely from animal to animal, and even from breed to breed — and also from owner to owner. For instance, fish and reptiles can drain your wallet by increasing the cost of your electric bill. Larger breeds of dogs will eat a lot more food than, say, a Chihuahua, and long-haired pets will need to go to the groomer more often. If you have allergies, you may need to get a hypoallergenic pet, which usually costs more both initially and in the long run. If you are away from home a lot, you may need to consider doggy day care or a dog walker, two services that add significantly to your total cost of ownership. OK, I admit it I’m not the goat’s grandmother, but I am the mother of the owner of this small group of Mini Nubians. My daughter has gotten into the goat breeding business with both feet along with my son-in-law and grandson. They are breeding the stock to gain a milk producing, polled (hornless) variety. They have one level to go before they can register the breed. She is also selling the bottle fed babies to keep her herd at a small size. She has one more female (Vee) to deliver shortly. In fact it should be sometime in the next week. She and my grandson always get excited when a new baby arrives. It’s always the cutest of any she has had before. I have to say she loves her goats. Below is an overview of Mini-Nubian Goats followed by pictures of the herd. The miniature Nubian Dairy Goat is the result of a cross between a Nigerian Dwarf buck and a Nubian doe. The goats maintain the looks, high percentage butterfat content, and mild flavored milk of the Nubian in combination with the smaller size of the Nigerian. In height, the Miniature Nubian falls between the standard Nubian and the Nigerian Dwarf. Mini-Nubian Goat does normally stand from 22-25 inches at the withers and weigh under 100 pounds. Bucks can be larger with a height up to 27 inches and weigh under 135 pounds. As one of its most distinctive features, the Miniature Nubian maintains the long drooping ears of the Nubian. They also possess the Nubian’s docile temperament, sweet disposition, and wonderful milk characteristics. Miniature Nubian Goats have an average milk production of 1525 pounds in 305 days; that is about 5 pounds or 2 quarts of milk daily. Although small, they aredairy goats with production capacity and teats long enough to get your hands on. Miniature Nubians come in a wide range of colors and patterns. They are friendly, hardy, medium size utilitarians that provide a lot of very healthy milk for their size and unparalleled brush and weed control. Kids grow quickly and although they are not used for meat much, extra buck kids still make good meat. The Miniature Nubian Goat provides a little something for everyone and is ideal for landowners who are attempting to produce their own food on just a few acres. Peppers is the white one and Taps is the black billy. Vee is standing on the building. They do love to climb (including cars). Demon Biting Mike. He’s such a cute little thing (not). This is Vee, she is the one that will deliver her kid in the next week or so. A Consumer Reports investigation has found troubling levels of arsenic in many of the 200 rice products we tested, everything from brown rice to infant cereal – even some popular name-brand cereals. Since the arsenic we found in these products could lead to increased cancer risks, it’s time health officials hear your concerns – and get serious about dealing with arsenic in our food! The FDA must set limits on arsenic in our food and drink, much like EPA does for our drinking water. And contributors to arsenic contamination, such as pesticides, animal drugs and fertilizers, should be completely banned. Industry can do its part too, by growing rice that absorbs less arsenic, and using rice with the lowest arsenic levels in children’s products. Organic rice baby cereal, rice breakfast cereals, brown rice, white rice—new tests by Consumer Reports have found that those and other types of rice products on grocery shelves contain arsenic, many at worrisome levels. OK, let me start out by saying this is my second attempt at posting for today. I’m not sure what happened to the first one but I think it’s floating around in cyberspace somewhere in a few hundred pieces. I’m not one that gives up easily so I’m doing it again. Today I feel like a cook and I want to share one of my favorite dessert recipes with you. It is mouth-watering good and easy to put together. I gave this recipe to a friend of mine in California and she now makes it every Easter for her family. Just to let you know, I did not name this cake. You will have to make your own judgements about the title. The ingredients you will need are: 1 yellow pudding cake mix, 1 large box of french vanilla pudding mix, a large can of pineapple, 1 cup of sugar and whipping cream. Bake the cake according to package directions. I bake mine in a mall aluminum turkey roaster for the high sides. Punch holes over the top of it and let it cool. While the cake is cooling place the sugar and pineapple in a saucepan and heat until all of the sugar has melted and you have a thin syrup. Pour this over the top of your cake. Let it cool. I put mine in the freezer to chill it down quickly. The trick is not to forget it. Mix up your pudding and spread it over the cooled cake. At this point you can sprinkle anything you want on top of the pudding. I use coconut and pecans but it’s entirely up to you what you use. Mix up a bowl of whip cream and put it on top of the pudding. You can sprinkle what you want on top. That’s all there is to it and you have a super moist melt in your mouth cake. Be sure any left overs are refrigerated. Changing subjects completely, I want to remind you to enter the 100 word flash fiction contest. You can find the instructions in the previous post. I am also posting for Mark Lee, from the Masqueradecrew blog spot, Click HEREHe is wanting to tell you about a contest the crew is doing. We’re hosting a short story writing competition. The prompt is being emailed to early responders right now, and it will become public on our website March 15th. But we need more than just submissions, although we’ll take as many as would like to enter. There’s lots of other things people can do to help us out, however. For instance, we need judges or readers. We’ll also need people to help us edit the winning entries. Last but not least, as is being done here, we need people to spread the word, tweeting on Twitter about it or hosting a guest post from us. Whatever you would like to do. We would like to get the word out now, but also during the competition. In exchange, we’ll promote you and/or accept guest posts from you. Interested in helping, let Mark know. I wish you well until the next time. How many of us has done something you thought would be so nice and work out wonderfully. Today, I am posting a short story about a woman with good intentions. You never know what will happen in this life. Every action as a reaction. I hope you enjoy the story. Friday, April 16, 2010 is a red-letter day. I have a new job, I live in my own condominium, my health is good, and my family loves me. I have so many blessings I cannot list them all. I have a boyfriend, Andy Wilson. He is such a loving person. He makes me happy. I keep a smile on my face when I am with him. I am falling in love, and I never want it to end. He’s a man who has everything. He is wonderful, happy, smart, rich, educated; handsome beyond words, and is still single. The doorbell is ringing. I slowly cross the floor and open the door. “Come in, Andy”. “Wow, you look wonderful”. He grabs me, pulls me towards him, and kisses me. “This is wonderful and I don’t want it to end. Would you care to dance?” Andy asks. We dance as my mind keeps telling me; this is too good to be true. “Sit down on the couch. Would you like a glass of water”? His face was beginning to swell, especially around his mouth. “Andy, I need to call an ambulance for you. You are beginning to scare me”. I called 911, gave them the address and went to Andy. I follow the ambulance to the hospital. It seems I waited forever, and then the door opens and a nurse in scrubs comes to me, and asks if I am the person with Andy Wilson. She took my hand, ”I’m so sorry, but we couldn’t save him.” My world went cold and black. Andy died from anaphylactic shock. It turns out he was highly allergic to peanuts. I kept running our dinner repeatedly through my mind. Where could he have gotten peanuts with our dinner? I went to the pantry to get down my oatmeal. My eyes scanned the shelves; I notice two bottles of oil sitting next to each other. 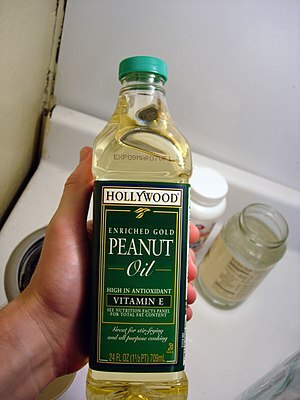 One was a light corn oil and the other was, the other was, oh my god, it’s peanut oil. Now I know, I killed my Andy with good intentions.